Where does your personal drive come from to contribute to a sustainable world? My name is Asha. My name means ‘hope’. My hopeful message is that we, as people, are not set in stone! We can create a happier and more caring world. And it starts when each of us takes action by prioritising happiness in our homes, workplaces and communities. We start to change the world when we change our own mind and life. Imagine a world where any human being can be who they already are and experience happiness. I want to live in a world like that. Do you? 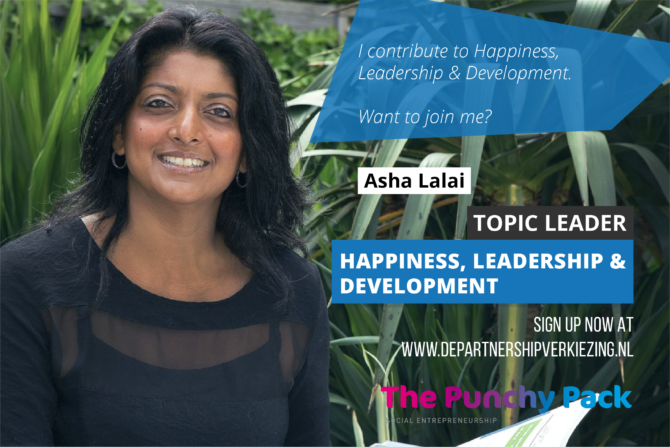 Through what action can organisations trigger employee’s happiness, leadership & development? By increasing awareness that happiness is the highest level of human growth. Then choose happiness. Make happiness your priority. There is so much research about the benefits of happiness. If you want to be successful, happiness is your way. I’ve been working in this field for 20 years, and I’m more than willing to share how organisations can use this research in a very practical way and build positive and happy organisations. I don’t like name dropping. But the organisations I work for :-) Action for Happiness, One Billion Happy and the Happiness Studies Academy are utilising this responsibility. How can young professionals work on their happiness, leadership & development to contribute to creating sustainable solutions? Very simple. Start with yourself before you help others. Ask yourself: Do I prioritise my happiness? Am I living up to my own expectations? Do I feel the compassion for the people around me and support them to prioritise their happiness. Happiness is contagious. If you prioritise happiness and experience happiness you will, in turn, make others happy too. A lot of us grew up with the notion that if you work hard, you will become successful. This is true to some extent. Working too hard also causes tension and possibly burn-out. My advice for young professionals: don’t buy into the idea of you having to work very hard and get the right education, the next promotion, etcetera, and, in the end, you will become happy. Science and the personal experiences of many around the world show us that the formula is the other way around. Prioritise your happiness, feel compassion for the people around you. And you will be beyond successful.